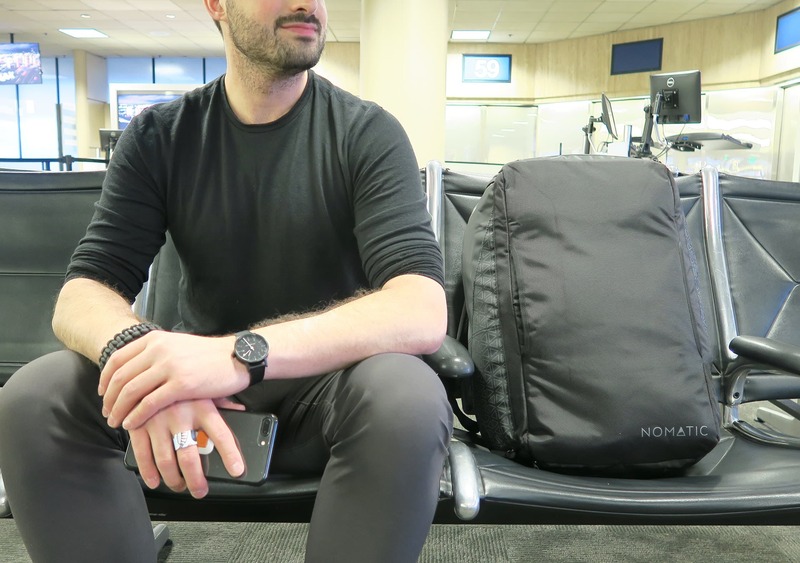 After raising an enormous $5m on Kickstarter and Indiegogo, the NOMATIC Travel Bag promises to be “the most functional travel bag ever.” In practice we found that claim to be a little hit and miss. 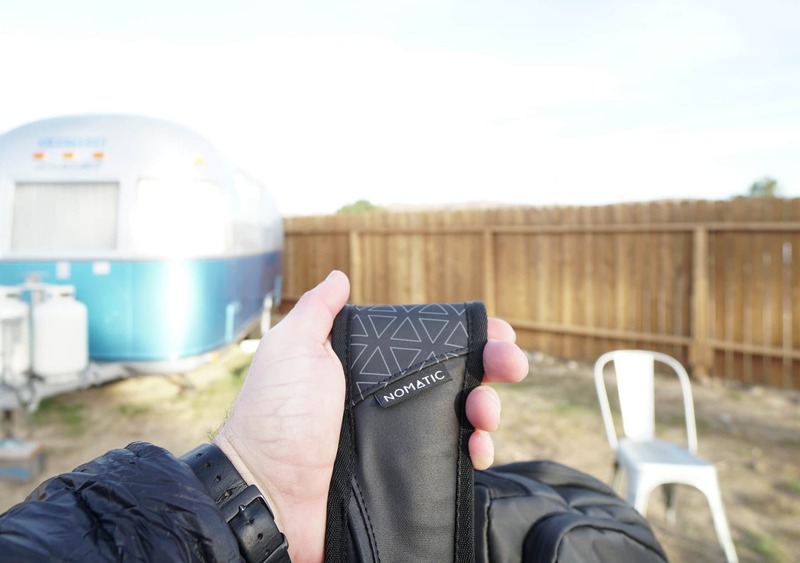 NOMATIC is known for their extremely successful crowdfunding campaigns, where they create innovative and unique travel gear. 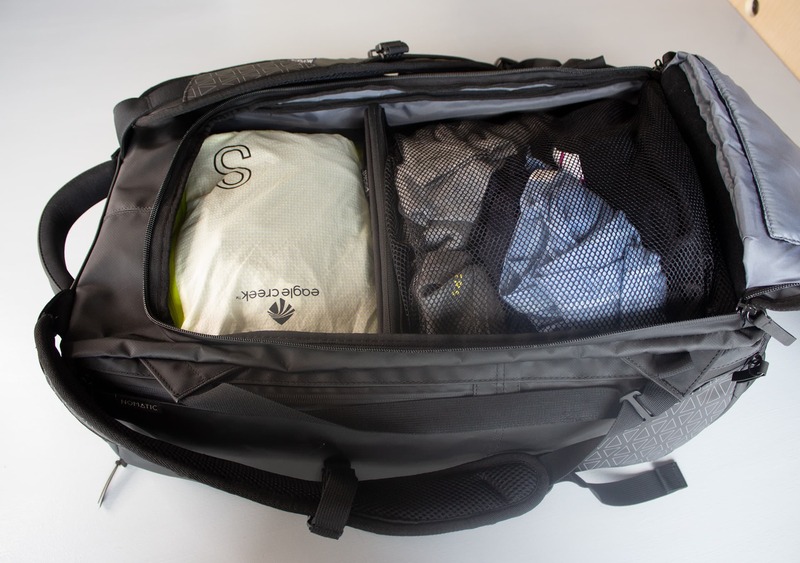 Designed as “the most functional travel bag ever”, the Travel Bag raised a massive $5m on Kickstarter and Indiegogo combined. It’s maximum legal carry on compatible and comes with lots of unique features that you’ve probably never seen before. But will those features actually prove to be functional on the road? 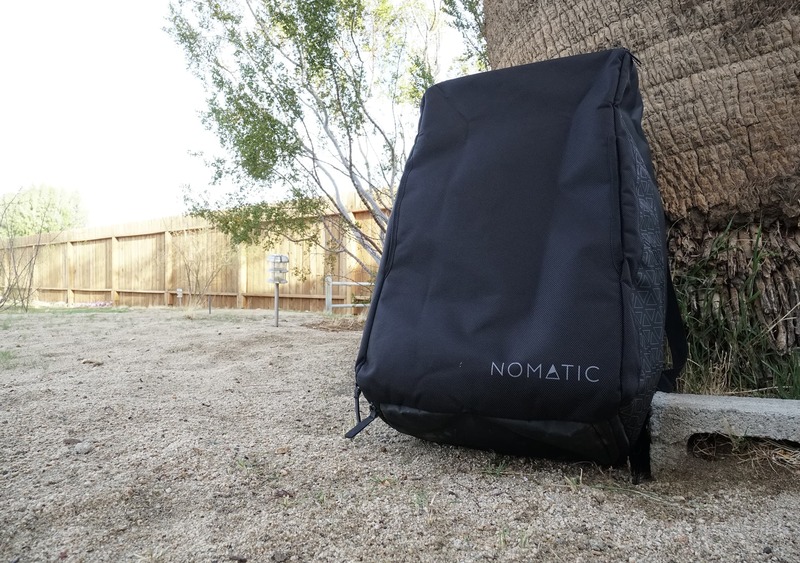 We took the NOMATIC Travel Bag around Detroit, LA, Joshua Tree, New York and Minneapolis for testing and to find out just how practical these unique features really are. Not to be confused with their “Travel Pack,” The NOMATIC Travel Bag looks like a giant box on your back—because that’s basically what it is. 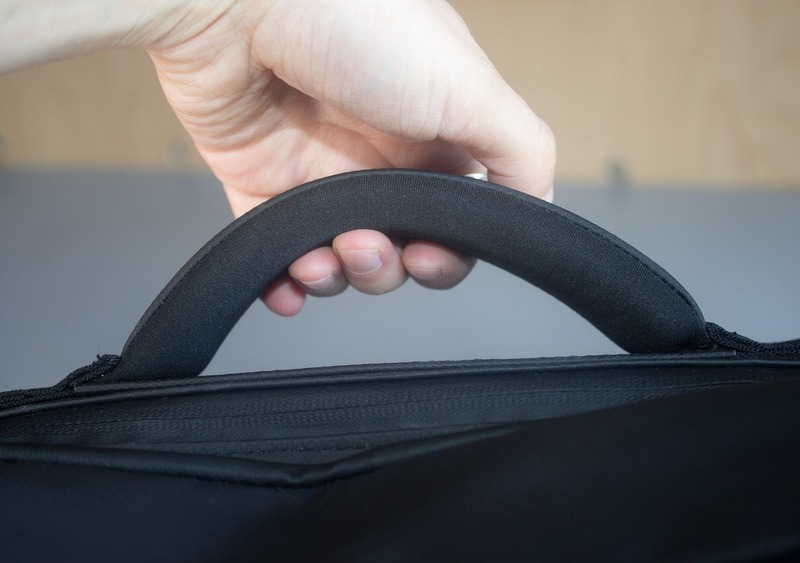 Other bags that utilize a “box-y” shape, such as the Minaal Carry-on 2.0, have added some curvature to the edges, making it less box-like. Not so with this pack! NOMATIC really went all-in on this one, taking advantage of every corner to maximize space. The result is some pretty sharp, box-like corners. If you can’t tell already, we aren’t huge fans of the aesthetic—but you do get that extra capacity in the corners which is always nice to have. NOMATIC boasts that the bag is made of strong, waterproof tarpaulin material that will “last forever.” However, we’ve found that while the tarp is strong—and totally weather resistant—the other materials on the bag are somewhat lacking. The tarpaulin material makes up the top, front, sides and bottom of the pack (5 out of 6 sides of the cube), and there’s also some on the straps, along with some foam padding. However, that means the back panel is not made from waterproof material. It’s made of a ballistic weave (either polyester or nylon material) and some more padding. What this really means is that if you were to place the bag in a puddle of water, the water would seep right in and soak all your gear. This seems like a strange choice to us. Why advertise the pack with waterproof materials, when the bottom of the pack, where you set it down in duffel mode, isn’t even water resistant? Just as a chain is only as strong as its weakest link, this front panel seems to negate the benefits of the tarpaulin that is used for the other panels (which, as it happens, is totally weather proof, seriously resilient stuff). We can’t seem to figure out why they wouldn’t have just included the tarpaulin (or some other waterproof material) on the back panel as well. Lowered costs? Worldwide tarpaulin shortages? A full-blown government conspiracy? Who knows. In terms of branding, there is a simple, low key logo in the bottom corner. We’re fans of minimalistic branding here at Pack Hacker, so we’re glad they didn’t go with anything more flashy. In addition to the logo, they also have some triangle patterns in various places on the pack (the trendy mountain/triangle image is their logo). These are a little bold for our taste, and we’d prefer the designs to be a bit more subtle. Perhaps less contrast between the pack and the triangles would help, or just having the designs appear in fewer places. Having said that, some people certainly appreciate more conspicuous branding—to each their own. Wrapping it up, there are some sturdy Duraflex® buckles used on the harness system, and metal zippers on the pockets and main compartment. 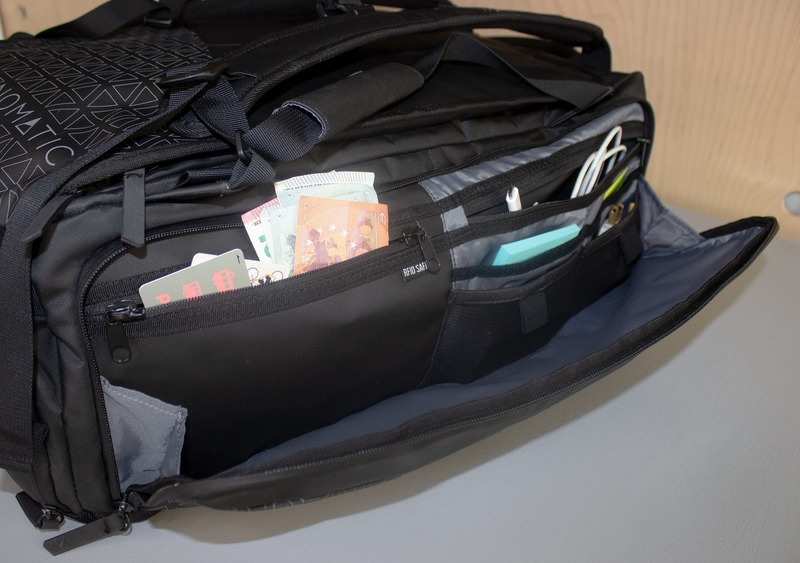 The main compartment also features some partially “hidden” zippers, for increased security. Overall, NOMATIC has chosen some solid, durable materials for this pack—although we’ve heard a couple reports of broken zippers. And while we do love the waterproof tarpaulin, we just wish it encompassed the entire bag. Alas. Let’s move on and take a look at the outside of the pack. 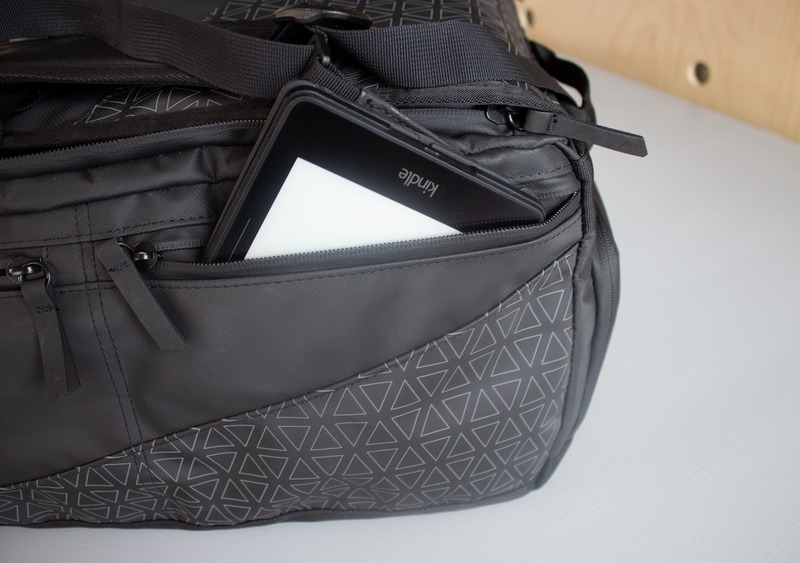 One quick look at this bag and you can easily see that the external features of the Travel Bag are… minimal. The folks at NOMATIC have chosen to maintain a simple external style, reserving the main innovations for the inside of the pack. It certainly makes for a clean look! There is also a smaller handle on the bottom side of the pack. We have found this to be useful when pulling your pack off of conveyor belts at the airport, grabbing it from underneath a bus, or out of an overhead bin. In general, we’ve found that additional handles are rarely a problem and can actually quite convenient. In contrast to the top handle, we think the bottom handle is actually a little too thin! We wish NOMATIC had balanced these handles out a bit. Take a little padding and strength from the top handle and add it to the bottom one, then both would be perfect. Halfway down the back panel is a horizontal “pass through” section, so you can carry it securely on top of a roller suitcase when passing through the airport or getting to your bus or taxi. 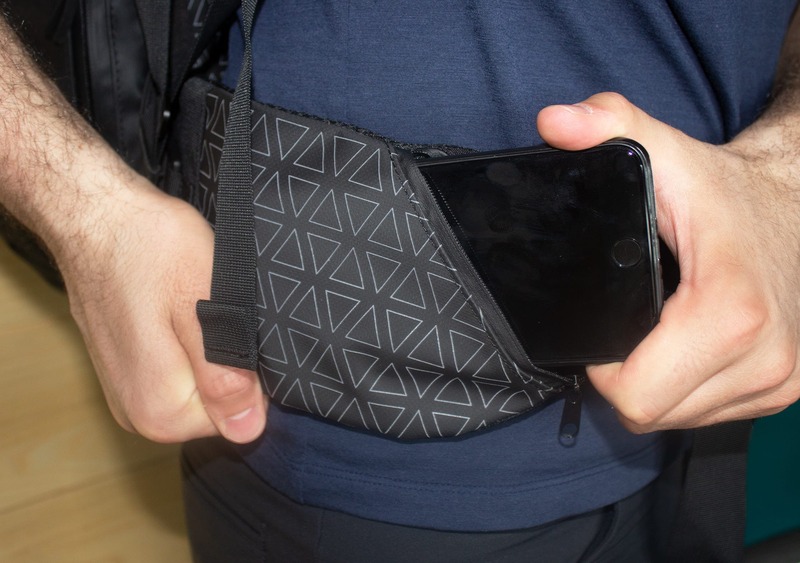 NOMATIC is obviously targeting a broad section of travelers with this pack, so this feature will be super useful if you’re traveling with roller luggage. Now we come to one of the main talking points of this pack—the shoulder straps that double up as “duffel style” straps. NOMATIC has designed this bag as something of a cross between a backpack and a duffel bag. This means the straps are a bit more complex than your average shoulder strap. Rather than being solidly anchored at the bottom of the pack—as with most backpacks—the straps run through a Duraflex slider and back up to the top of the pack. When you want to carry the pack in duffel mode, you can pull the “extra” section of the straps (that run back up to the top of the pack) and carry the pack using those—just like a duffel bag. 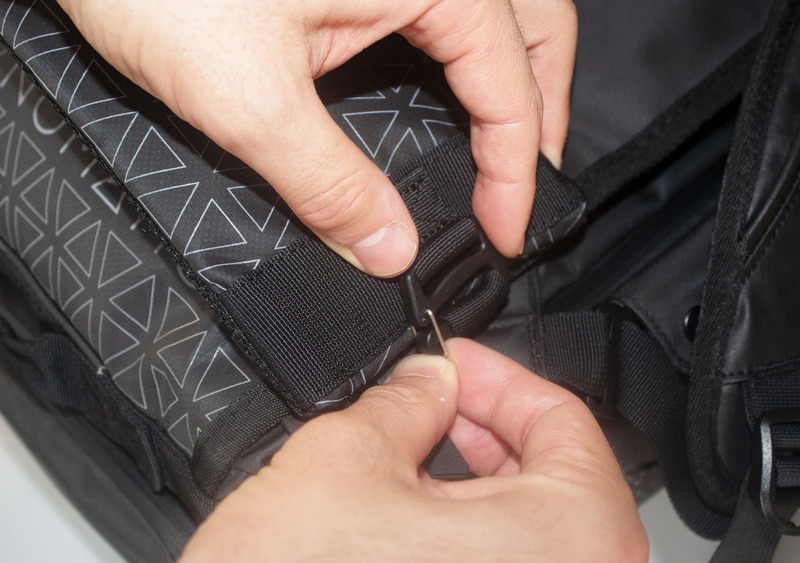 When it’s time to use the bag in backpack mode, just pull the “main” sections of the straps (which are padded, and run from the top of the pack down to the sliders) and use those to carry the bag on your back. It’s a novel concept, with a fairly slick execution. NOMATIC even has a clip in their promo video where the guy converts it to a duffel by throwing the bag up in the air, grabbing the straps on the way down, and walking away all non-chalant. But in practice, we didn’t find it to be all that practical. While we did give it a go ourselves, it took a few tries to get it right—and throwing your bag in the air while flailing your arms as it careens to the ground in the middle of the airport is decidedly not cool. Our final point on the shoulder straps is the absence of load lifters, meaning the pack tends to sag a little, especially when not fully loaded. With all the thought and research that’s gone into this pack, it’s surprising they missed these out. Load lifters would have been a small addition that would really improve the carry. In addition to the flawed harness system, there were a few other practical blunders with this bag. Firstly, this thing is really wide. This means you have to hold it quite far away from your body to avoid it bumping into your legs while you walk. If you take a look at the marketing photos on NOMATIC’s website, you’ll notice that even their models seem to be holding it far away from their body as they carry it in duffel mode. This isn’t an enormous gripe, as you likely won’t be using it in duffel mode very often—but it isn’t quite as functional as NOMATIC might make it out to be. Secondly, the duffel strap is designed with a fabric handle, which wraps around the straps and clips in place with some snap buttons. Because of the width of the bag and the fact that we were carrying the pack fully loaded, these buttons actually popped undone when lifting the pack. It seems like this system could have been thought through more carefully. Developing systems to improve the carry is all good, but what’s the point of having that feature if it won’t function properly when the pack is fully loaded? Finally, another nitpick with the system is that we often found ourselves catching a hand on the duffel straps while putting the pack on as a backpack. It’s not a huge issue—and perhaps we would get used to the “technique” as we used the pack more—but it just seemed like an unnecessary inconvenience when all we wanted to do was grab the pack and go. As far as we’re concerned, you shouldn’t have to learn a special technique to put a backpack on. With all this discussion around the multi-functional shoulder strap system… it begs the question: when would you actually want to carry a bag of this size like a duffel bag anyway? Generally duffel bags are used to carry gear for short distances, like from your car to the gym. For longer travel, the shoulder strap backpack design is better in almost every way. 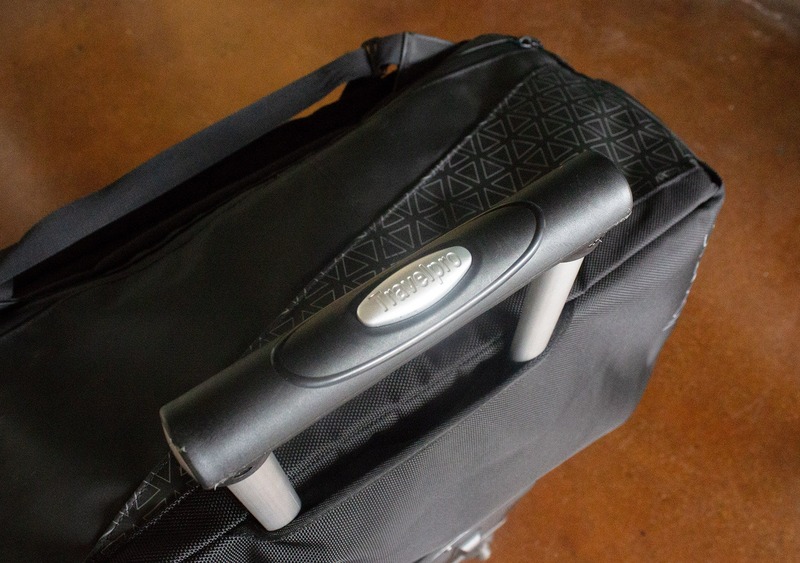 There are certainly situations when you want to just grab the bag and carry it a short distance—from the security conveyor belt to the inspection table is one that springs to mind—but that’s what side handles are for. 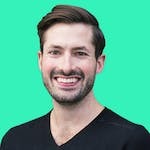 It seems like a problem that’s already been solved in a much simpler way, and we’ve been starting to feel like the whole duffel bag function is a little gimmicky. Anyway! Enough gripes. Let’s take a look at the hip belt, which we really like. Unfortunately for some body types—namely those with a longer torso—the “hip belt” will actually work out to be more of a “stomach belt,” which can be uncomfortable. Not to worry though, because the hip belt is detachable, and that makes us happy! With a pack of this size, a detachable hip belt is always a welcome addition. With smaller bags you can get by without it, but when you’re talking about a larger bag for extended travel, you really need a hip belt. Of course, if it doesn’t fit you properly, it’s great to have the option to remove it, rather than having the unused straps flapping around all the time. Another thing we like about the hip belt is that it has pockets with a slanted zipper. Having the zipper at a slanted angle makes it easier to look down at what’s inside the pocket and access your quick grab items while wearing the pack. The only complaint we have about these pockets is that they aren’t 3D, which reduces the capacity and limits what type of items you can put in them. If you’re planning to put something long and rigid in here—such as your phone—it’s going to be tough. Larger phones have a pretty tight fit. Plus, if you do get it in, it means the hip belt won’t wrap properly around your waist. Long story short, these pockets are best for smaller items or flexible stuff like cash, tickets or receipts. With all that said, most of the features are on the inside of the pack—so let’s open it up and see what we have in there. Alright, the inside of this pack is where things start to get interesting. Starting at the bottom of the pack, there is a spacious, separate compartment to store your shoes. We really love when bag companies include a shoe compartment! 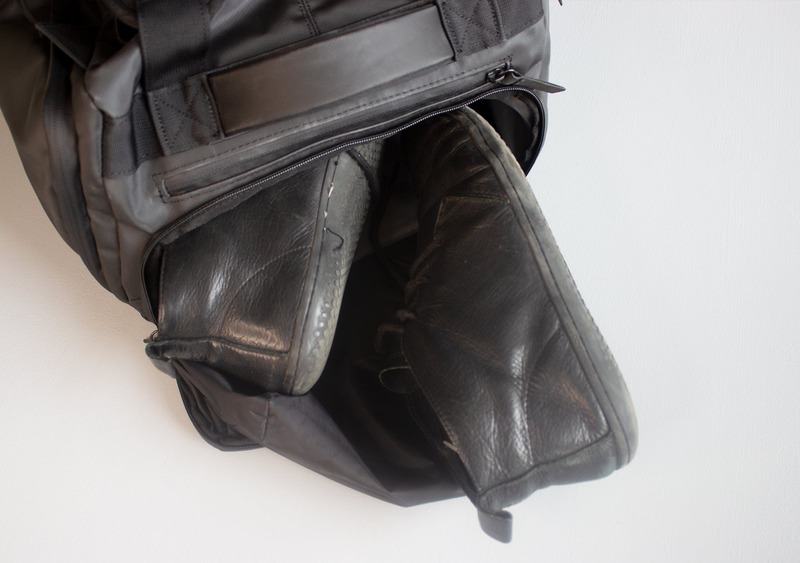 If you’re used to traveling with an extra set of footwear, you’ve probably ended up wrapping them in a bag of some sort and just stuffing them in your pack with the rest of your clothes. We prefer not have our funky shoes so close to clean underwear and toiletries, so shoe compartments are always a welcome addition. If you’re not carrying shoes, then this section will come in useful for storing bulky items you’d prefer to keep away from your clean clothes in the main compartment. Great for wet clothes or other odds and ends. 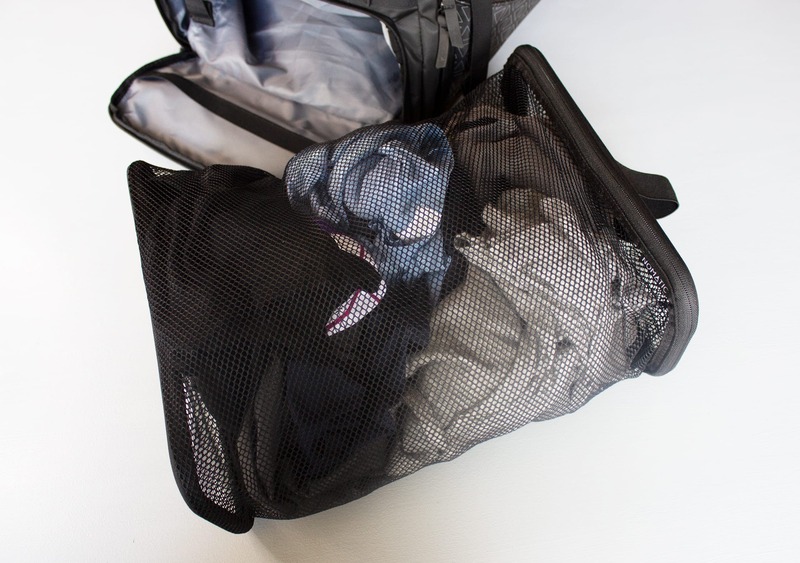 If you’re not planning on washing your clothing at all on a trip, you can just load up your dirty clothes in here and stuff the laundry bag in your pack when it’s time to leave. Take it all home and wash it there. Again, this solves a nice little problem for us. Too often we end up stuffing laundry items into plastic bags, or finding other ways to keep dirty clothes separate from clean items. This provides a great solution to that and it has the added benefit of helping to keep your hotel room floor free of dirty clothes. If you use it, that is. Taking a look at the top of the pack, there’s a pocket similar to the shoe compartment that opens right up and offers a good amount of storage space. It’s a bit smaller than the shoe compartment, and we found it useful for storing bulky items, or things like socks and underwear that you want to keep separate and organized. Right next to that pocket, there’s another pocket which is lined with a totally waterproof, shiny tarp-like material. Since NOMATIC doesn’t include any external water bottle compartments—because they wanted to keep that slick, box shape—they created this pocket to give the option of storing a water bottle. This, once again, solves a unique problem. We can all relate to that anxious feeling you get when putting water bottles in the main compartment with the rest of your gear (ie; electronics). Fear no more. This pocket could also be useful for toiletries. Not only to safeguard against leaks, but also because the location at the top of the pack provides easy access if you need to take them out quickly—like at security, or when you want to freshen up at a rest stop. Finishing up the top of the pack, there is also a little felt-lined pocket. It’s designed for quick grabs—passport, tickets and other items needed for security—but the extra special feature is the felt lining. Great for protecting your phone and other electronics from scratches—a really nice touch that we haven’t seen on many other packs. Moving on, on one side of the pack there are two external zippered pockets. One is two-thirds of the length of the pack, and the other makes up the final third. They’re simple pockets with no separate compartments inside. One of the issues with these pockets—like the pockets on the hip belt—is that they aren’t 3D. They don’t have their own dedicated space, so stuffing them with gear will eat into the storage space on the inside of the bag. Likewise, stuffing the main compartment to its limit will also make it hard to get items into the outer pockets. It’s not a major issue, but it’s worth noting that you’ll have to find a balance when packing your gear. 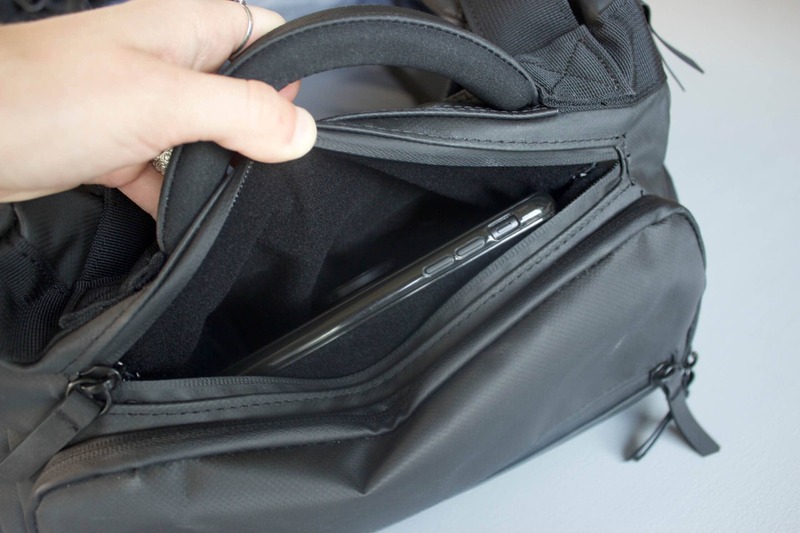 Flipping to the other side of the bag, there’s a large pocket that fully opens up and reveals a lot of small organizational compartments inside. 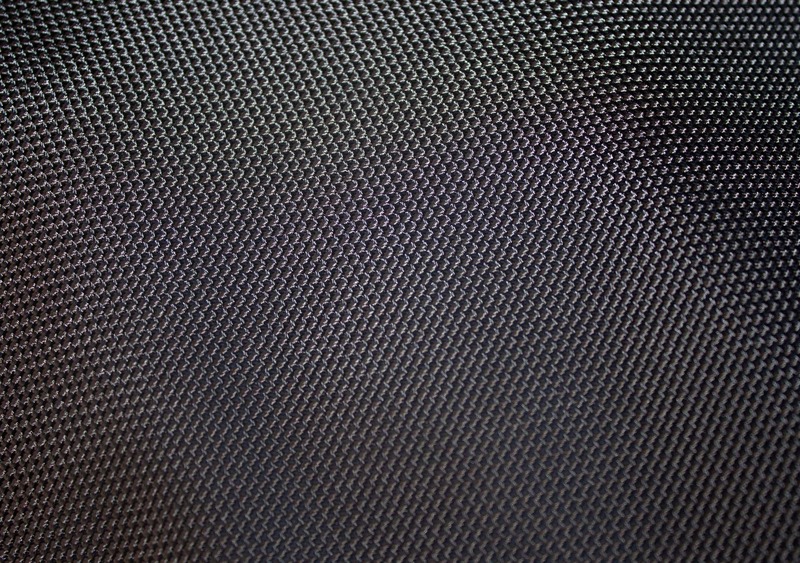 Looking closely, there are two stretchy mesh pockets down at the bottom, as well as another felt material section. At the top, there’s a fairly large compartment that opens and closes with a zipper. We also have a pocket that’s lined with RFID-safe material. It’s designed for things like passports, credit cards, phones, or anything that you want to block from external signals. Whether you actually see value in this feature is a matter of personal preference, but it’s there for anyone who does want to use it. It’s still a great pocket to have, even if you’re not really concerned about the RFID protection element. Overall, the zippered pockets in this section are going to be the most useful. The nylon, stretchy pockets and slider pockets are nice to have, but when you start moving around the contents are going to get mixed up inside, undoing all that organization. The items in the zippered pockets will stay put. You also want to be a little careful when opening up this section—if you end up with loose items bouncing around they have a tendency to fall out when you open the bag up. The last thing anyone needs is their gear bouncing around on the street or on busy public transport. That’s no fun. 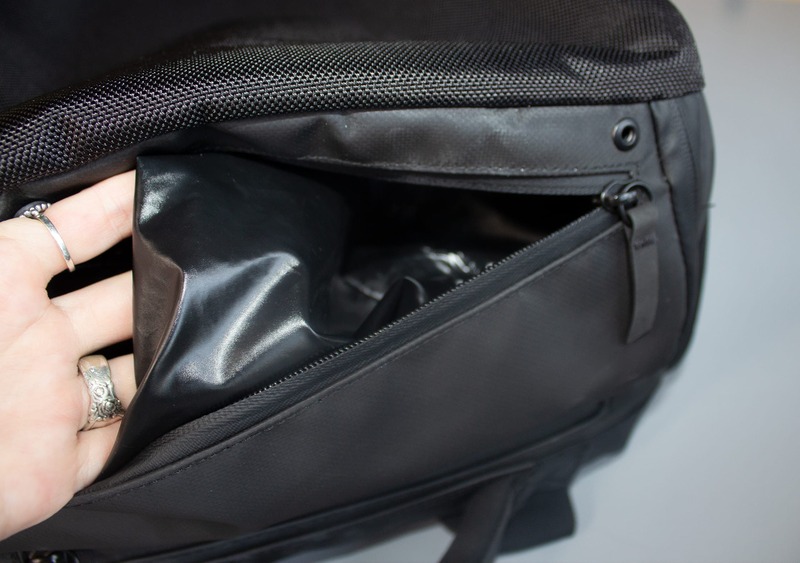 Now for the main event—the clam shell main compartment, which NOMATIC describes as “a full perimeter zipper to give you the widest opening possible, for optimal packing and easy access to the interior of the bag.” We can confirm that this is exactly what you get. It is basically a giant bucket with a lot of storage capacity. And it’s here that we’ve come to appreciate the sharp corners of the pack. Being able to pack right up into the corners means you can pack it like a suitcase, flat packing your clothes in a really organized way. The only thing to bear in mind here is that the pockets on the bottom and sides will eat into that main compartment space if you load them up too heavily. Employ a little mindfulness when packing items into the pockets/main compartment though, and you have a ton of room. We’ve found we can fit two rows of packing cubes in here, which is very satisfying and helps keep everything super organized. The main compartment is also ideal for flat packing clothes—especially shirts and other items that have been ironed and need to stay flat. Moving through the laundry list of internal components, we’re finally hitting on the oh-so-important electronics compartment. The lid of the main compartment is set up to accommodate all your flat electronics. 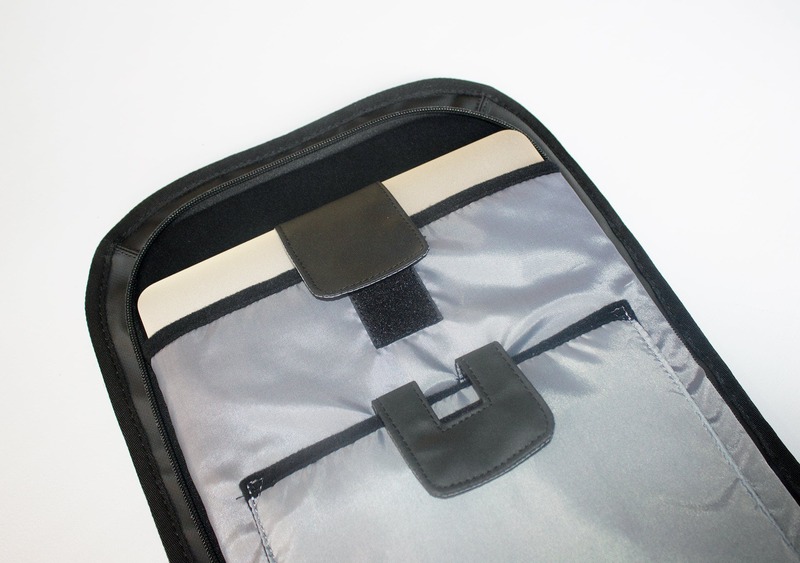 There are two flat pockets on the inside of the lid—a smaller tablet pocket and a larger pocket just behind that for your laptop. The laptop pocket is spacious, and we had no problem fitting in a 15-inch Macbook Pro. Unfortunately, there is a small issue with this system. When the bag is really full, it can feel like you’re jamming down your electronics if you try to force the lid closed on an overly packed bag. You don’t get this issue when the laptop pockets are at the back of your pack (against your back, like a framesheet—the absence of which causes this pack to crumple easily and suffer from a lack of structure), as is common with most packs. Having your laptop in the lid of the pack also makes the lid very rigid. It’s hard to open the bag slightly, take a peek in, and grab whatever you need. You’re forced to really open the pack up before you can reach any items, because the lid won’t flex and give you space to reach a hand in. This issue is exacerbated somewhat by the zipper being somewhat hidden. It’s a security feature, which is actually really useful for preventing would-be thieves from unzipping your pack and grabbing your stuff. The flip side of this extra security is that it also makes it harder for you to just crack open the pack and reach for items in a hurry. 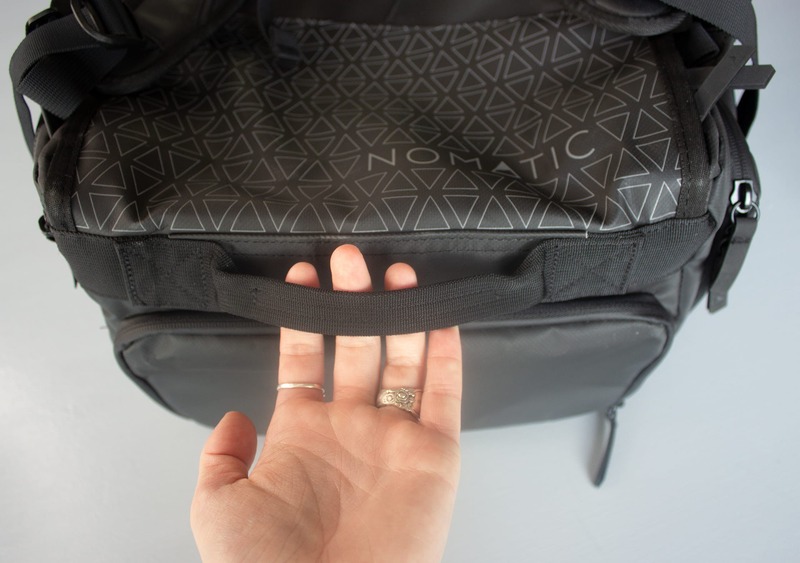 Having said that, NOMATIC has included a lot of external storage options for items you want quick access to, such as the felt lined quick grab pocket on the top, and the zippered side compartments. If you get used to using those, you shouldn’t need to reach into the main compartment too often. Overall, the internal features of this bag are pretty useful in practice. We’re especially pleased with the waterproof bottle pocket and the laundry bag, which are unique features that really come in handy while traveling. 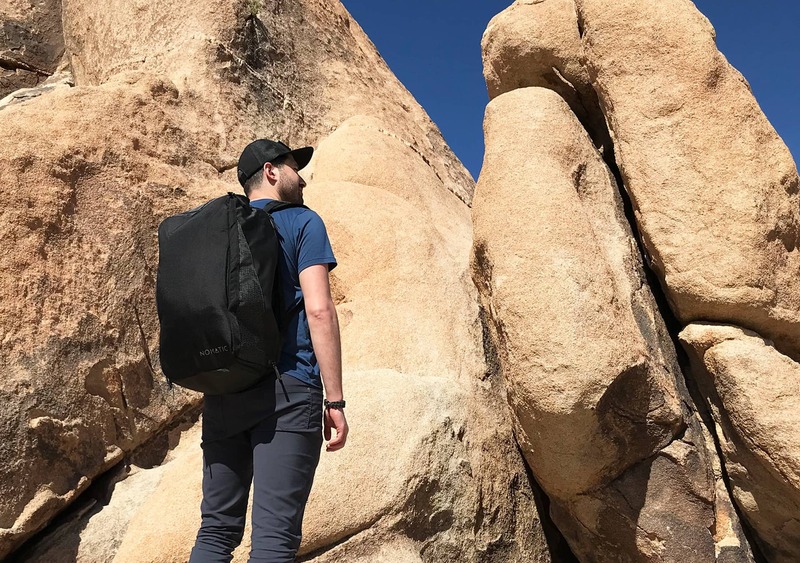 At the time of this review, we’ve been testing the NOMATIC Travel Bag on trips across the US, in cities like Joshua Tree, Los Angeles, Detroit, Minneapolis, and New York City. Overall, the durability and quality of the pack has held up so far. There aren’t any scratches or scuffs on the material and we haven’t noticed any fraying or damage. The pack is working well, but the couple of gripes with the harness system and the unbuttoning duffle straps right of the bat are ominous signs. Same condition – no blemishes on the fabric yet and overall holding up well after 2 months. Optimized size for maximum legal carry on. Nice additional touches, such as waterproof pocket, shoe compartment and laundry basket. Hip-belt is detachable and comes with slanted-zipper pockets for easy access. Laptop compartment isn’t ideal for quick access and can make it hard to close the pack. Duffel and shoulder strap system is a little bit clunky in practice. The pack is trying to do too much and it clutters the experience. 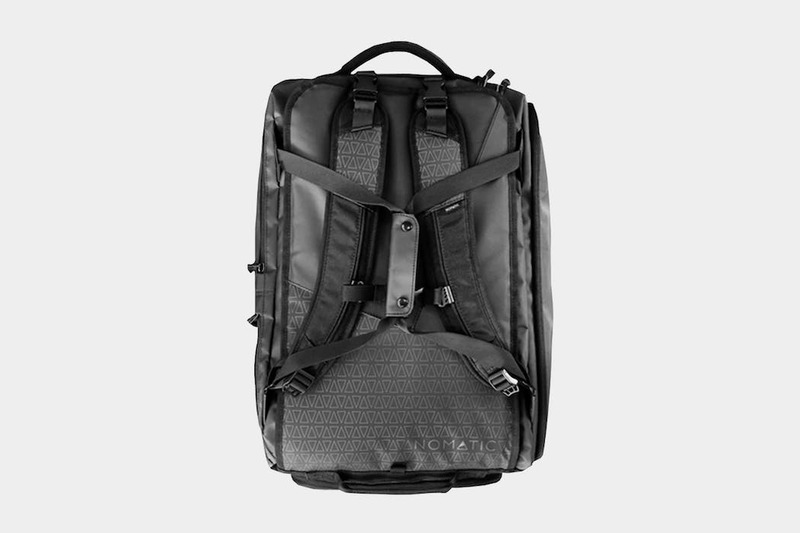 The NOMATIC Travel Bag comes with a lot of promises and a lot of unique features. We made sure to use the bag enough to really test those features out and discover if they’re actually functional in practice. While we did find many of them useful—namely the organizational elements, the water bottle pocket, the shoe compartment and the laundry bag—there are a couple that didn’t really work as well as their marketing copy may suggest. 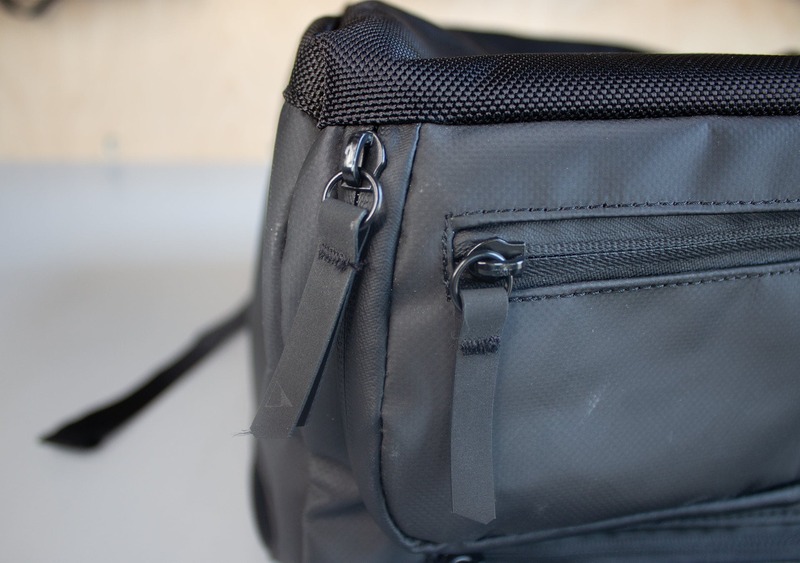 There are areas of this design (such as the duffel strap system) that end up awkward and clunky, making us feel like more thought could have gone into it. 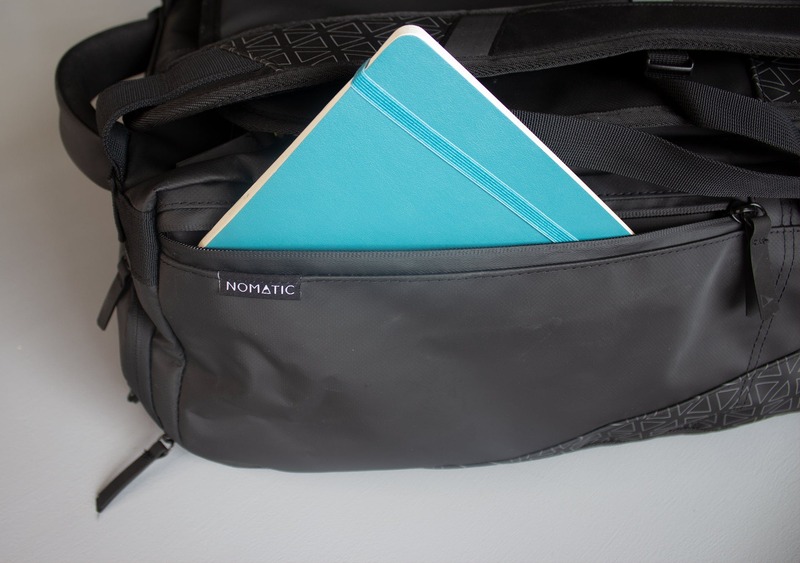 Overall, the NOMATIC Travel Bag offers a few novel features and has obviously had a lot of research and innovation put into it. However, we’ve found the hit and miss experience of the features mean the bag seems greater in concept than it actually performs in practice.